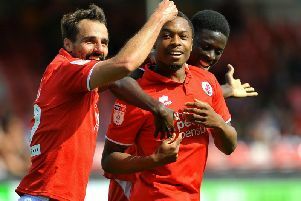 Crawley Town striker Lee Barnard scored two goals as Reds beat AFC Wimbledon in a friendly. Luke Rooney set up their third goal which was nodded in by Jon Ashton. Gavin Tomlin returned to the starting line-up after missing the last three games through injury. Crawley took the opportunity of having a look at two triallists. The game was played on Tuesday at Wimbledon’s training ground.